If you would like to write or update your status on WhatsApp on your Android device, this guideline will help you about that. However if you are facing with problem with updating your status on the application, we recommend you to check our guideline about that. You can also check our iPhone guideline if you are using any iOS device. 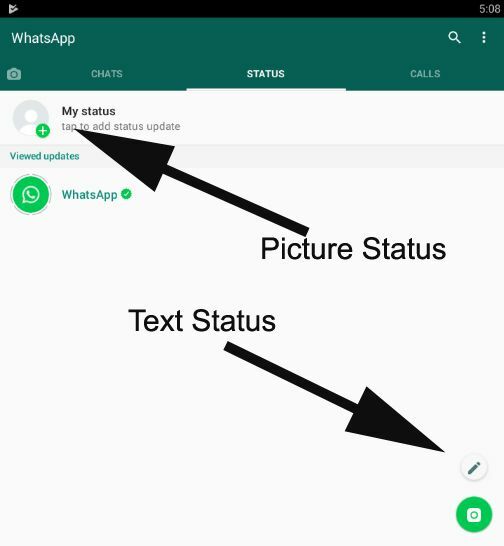 You will also find information how to put a picture on your status here but you will need to enable picture access for WhatsApp on your Android device. 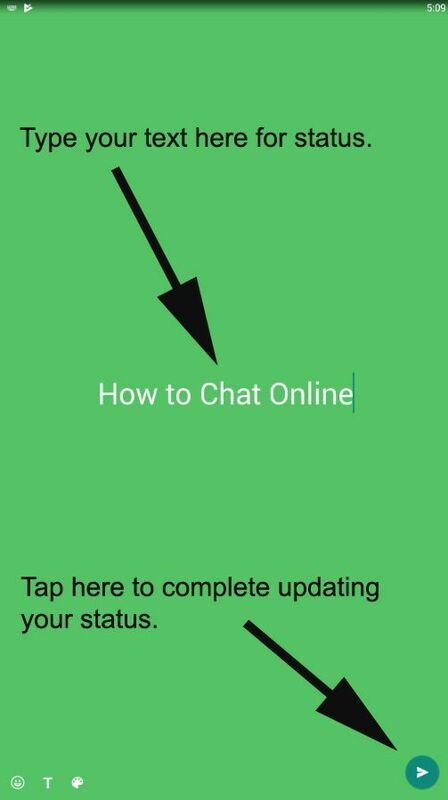 You need to do the following steps to write a status or updating it on WhatsApp Messenger. 1-) Run WhatsApp Messenger and tap on Status like we have shown in the picture below. 2-) You will see two options for you at the new page. You can tap on “My Status” (already there is a text below of that as “tap to add status update”) for adding a picture to your status and you can tap on pen icon at the bottom right of the screen for adding text status. Please check the picture below. 3-) You can take a picture of you or add a picture from your gallery to picture. You will need to type a text for adding a new status. After a you click on the pen icon which we have shown you above, a text area will be open on your phone. Add your status there and tap on green arrow button to complete it. Now you are done, your status is going to appear for everyone if you let it on status privacy. We are going to give more information for you about privacy of your status at incoming pages. You can ask us anything about updating your status on Android. I cannot change my WhatsApp Status. Why? This is one of common issues about WhatsApp. Please click here to get more information about the problem. We have mentioned about the problem on How to Chat Online.